Two blue shipping containers, an orange fuel tanker, and a makeshift fence are barricading a Venezuelan bridge at a key border crossing with Colombia in an attempt to block humanitarian aid from entering the country. 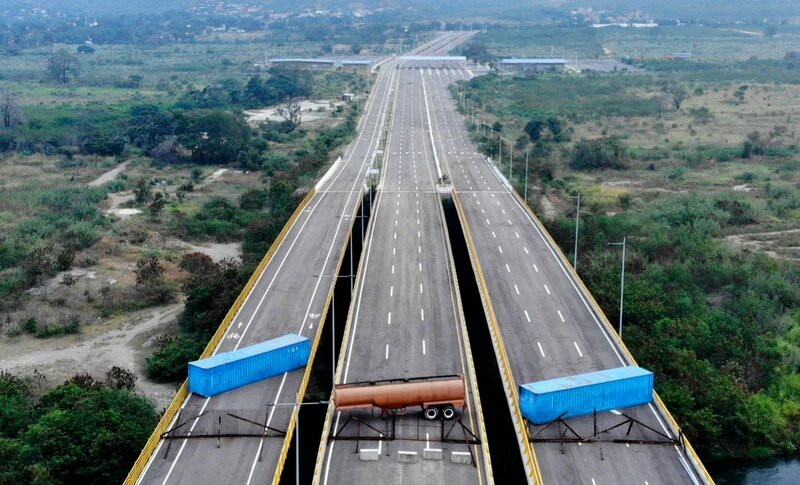 The Venezuelan National Guard on Wednesday blocked the Tienditas international bridge which connects the two countries and has become the location for a planned relief effort backed by the opposition. “It’s means of intimidation, but I don’t think it will accomplish anything,” said Alba Pereira of nonprofit Entre Dos Tierras. “It’s convenient for them to let the country continue enduring this absurd crisis. U.S. Secretary of State Mike Pompeo blasted the Venezuelan military's actions and demanded the bridge be reopened to let the aid through. "The Venezuelan people desperately need humanitarian aid. The U.S. & other countries are trying to help, but #Venezuela’s military under Maduro's orders is blocking aid with trucks and shipping tankers. The Maduro regime must LET THE AID REACH THE STARVING PEOPLE. #EstamosUnidosVE," he tweeted. "Humanitarian Aid" shipments most likely ladened with weapons. Seen the pony trick before now haven't we?